1. THE DITCH is in an area that slopes down to our southern neighbour’s property. This natural shape in the land allowed a watercourse to develop that not only carried the soil away from our side but also was gouging out a channel on the other side down to the river. Placed carpet along the water course. 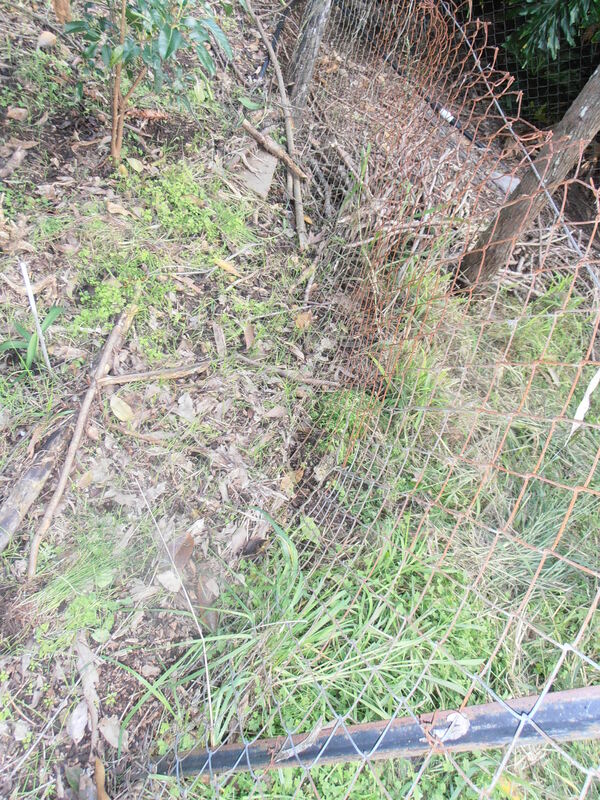 Used a fence as a barrier at the bottom of the ditch to help the soil accumulate there and not be carried into the neighbours’ yard. 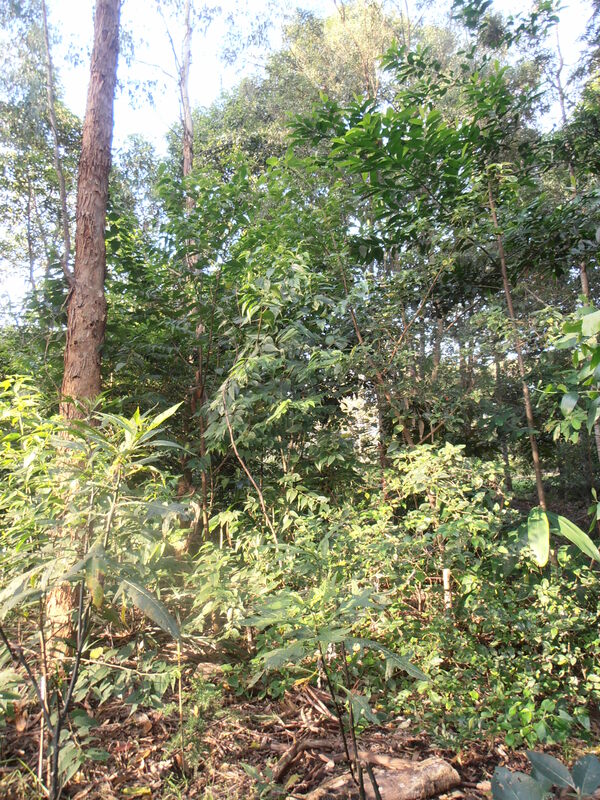 Larger trees (such as a Blue Quandong) were planted near the barrier and these have thrived on the good soil and moisture. Kept repeating the above steps such that today the whole area has a different atmosphere of coolness. When we dig down to plant more natives it is still possible to see the fine nylon netting which must have been the backing on the carpet. 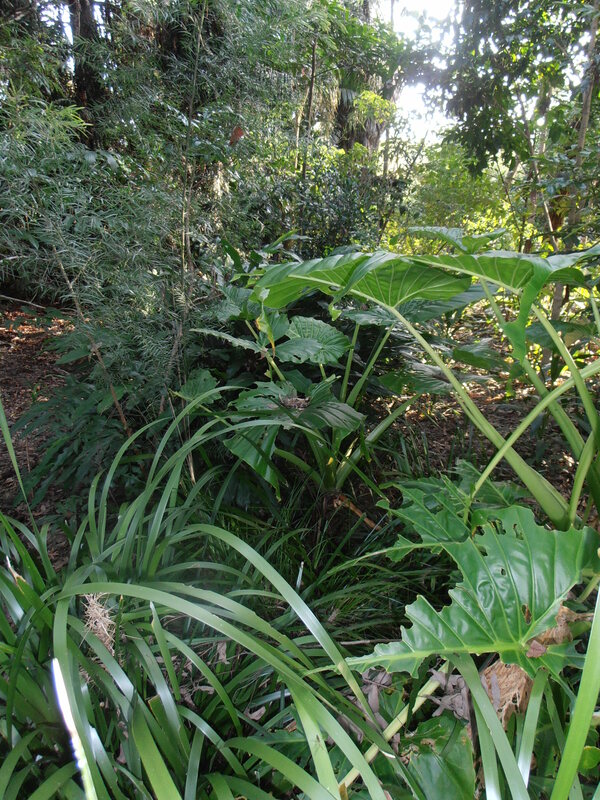 It has done such a great job of consolidating the soil and turning it into a lush, leaf-littered garden. In the lead up to the 2011 flood there was very heavy rain which affected the drop-off into the neighbour’s property again but this time did not disturb the soil on the top side of the fence. 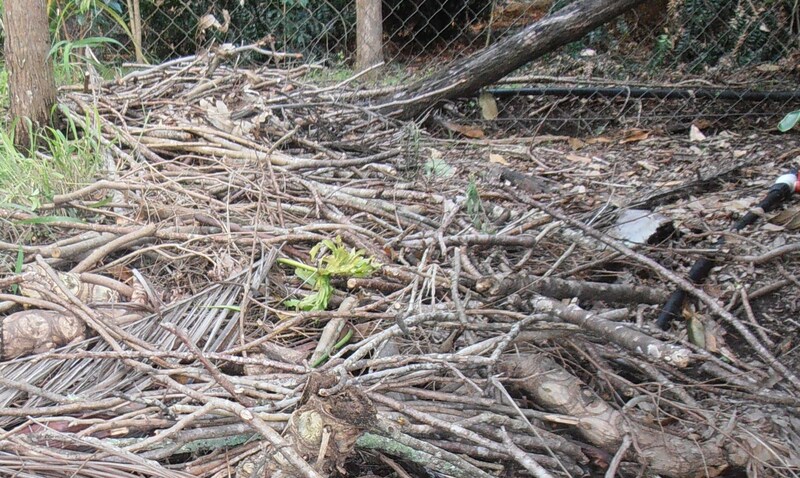 Since the flood we have been collecting loads of stick and dumping them in that site to build up the land again. Although the next diagram is simplistic it shows the basic problem of erosion that had developed in the side paddock where the run-0ff after rain was so strong – the neighbour’s property to the north is higher was well as the ridge inside the paddock – that it had created a deep gully leading down to the river. This in turn became a natural inlet to flood waters and as the water subsided it dragged away even more soil. The erosion in the next photo shows the degree of erosion that had taken place over the years. It shows one of the bowls that were gouged out of the gully probably with the most recent deterioration occurring in the 1974 flood. Without the roots of the eucalyptus tereticornis (on the right) and the roots of the old olive tree (on the left) the bowl of land would have totally collapsed. 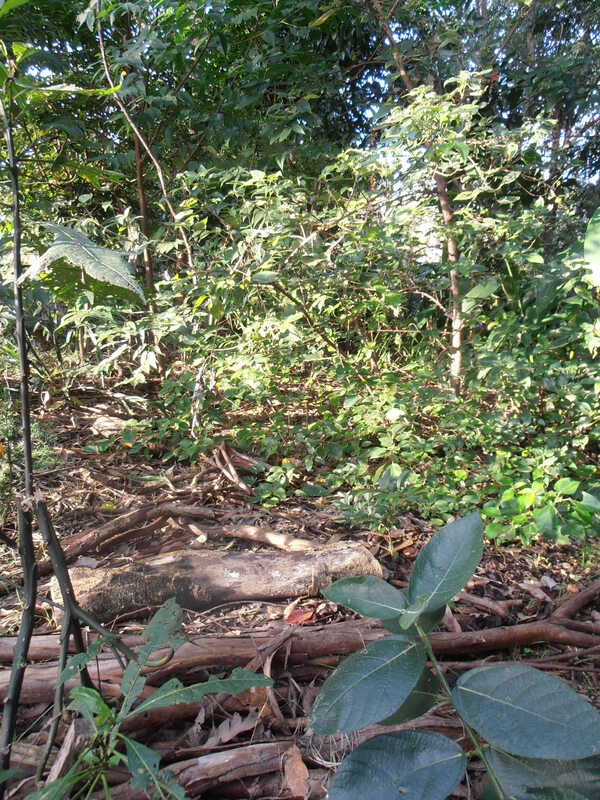 Large natural debris was thrown into the bowl (in the photo above) in the hope of eventually filling in and supporting the trees’ roots. A dam was built at the head (top) of the gully to prevent the water cascading down through the gully and making it deeper. The dam also would stop the good topsoil being swept into the river. Go to the Gallery of Dam Construction (subsidiary to The Creation of a Sanctuary page on the Menu) and there are step by step photos of this action. The building of the dam wall was a magnificent solution to this problem of erosion and even though it cost a lot to build it was instrumental in preventing enormous loss within the gully during the 2011 flood. 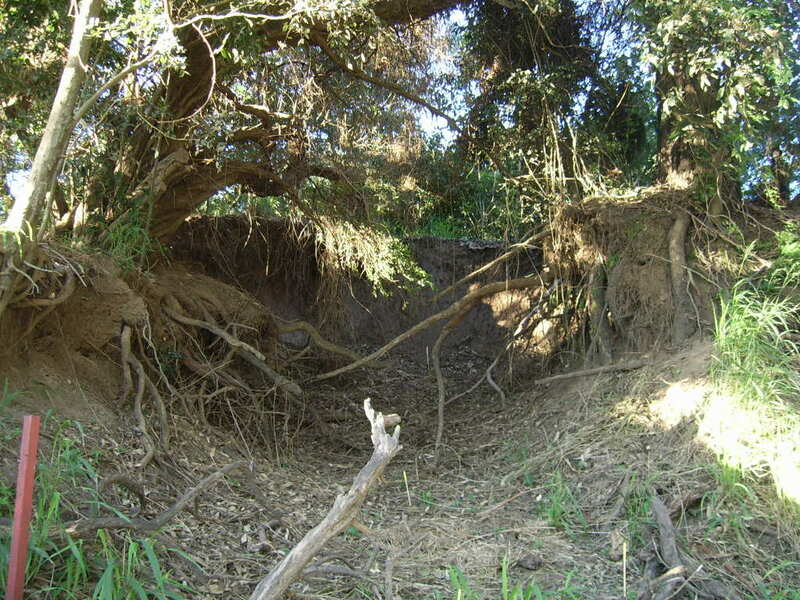 There was less erosion in the gully than at any other point along our river frontage. The huge pile of heavy branches that Ian and Andrew had thrown into the bowl (above) were lifted out and deposited about two-thirds of the way down the gully but this in turn became a barrier to soil loss as well! We have since planted inside the bowl: lomandras, blackbeans, sandpaper figs and a rubiginosa fig, plus lilies (the flood waters carried them up into the bowl). If you are interested in the erosion that resulted from the 2011 floods and the measures that were taken to stabilise the riverbank and hopefully prevent further erosion in the case of another flood then please refer on the Menu to Wildlife and the subsidiary Land For Wildlife page and scroll down to Assistance with erosion after the flood where there is a description and photos of the steps that were taken.